“Patient Room 2020″ is a new initiative designed to heal patients, and make it easy for family and doctors to care for them. What will the future of patient health care look like? 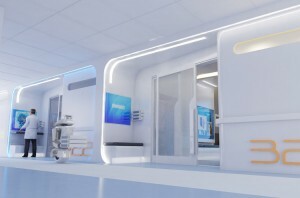 Perhaps something like the “Patient Room 2020,” a project that NXT, Clemson University, and Birdtree Design are trying to bring to market in the next 10 years. Clemson University’s Architecture + Health department have been designing, building, and evaluating multiple patient room iterations for the last eight years. Now, they are beginning to build working prototypes and test them to see if their designs can perform in real-life applications. “When you look at a typical hospital room, the technology and instrumentation is very chaotic and not designed to integrate,” adds David Ruthven of Birdtree Design. Patient Room 2020 turned that idea on its head. “We wanted to approach the room holistically,” he says. While most of the medical care is conducted within the patient room, several key functions for patients, staff and visitors occur at the entry to the space. Namely, the Staff Resource Station featuring sliding doors made from Smart Glass technology (privacy glass) to allow observation without entering the room while also protecting patient privacy & addressing the issue of infection control. This entry was posted in Healthcare, Smart Glass News. Bookmark the permalink.